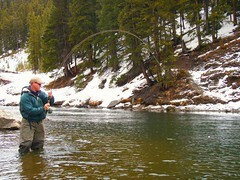 Nothing like Spring in the Rockies with a little luck and landing my biggest Rainbow trout to date, ohh what a weekend! 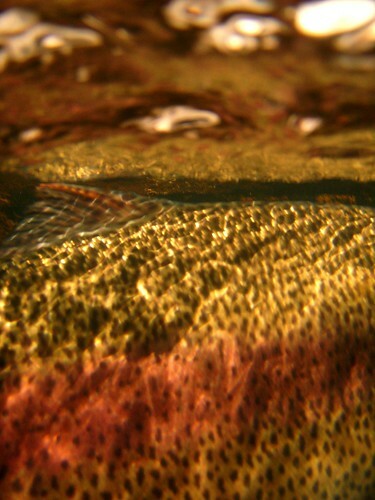 What is it about sight fishing for big trout that brings out a heart thumping nervousness that usually ends with no take or if lucky, a take than break off shortly after the battle has begun? This weekend was a little different and one I will not soon forget! 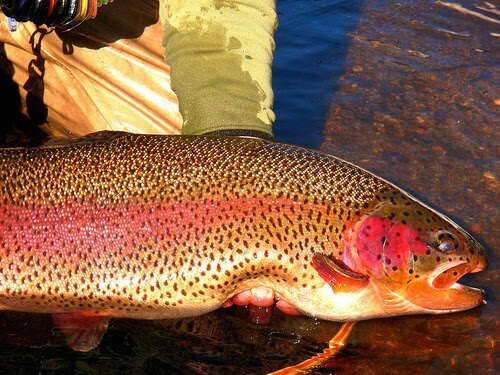 Catching big trout is something that most of us all want to do at some point or for many of my friends, something we can never get enough of. The next stage of fishing is "how the heck can I catch one?" that's the all important question and more times than not ending with another weekend left with what if's. This weekend was a little different with luck being a large part of my success. Catching this monster was my biggest to date and after landing a few fish over the years over 10lbs, this one takes the Cake! She measured in at 28" in length, 20" in width and topped the scale around 15lbs!!! 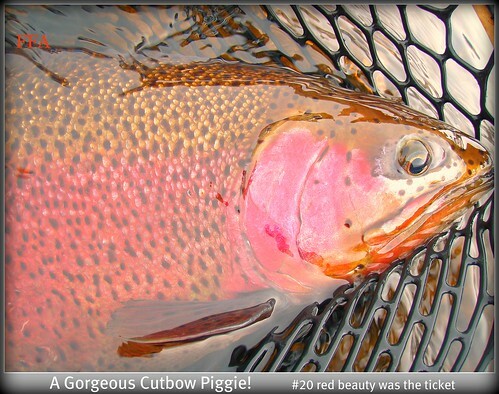 Another nice trout fell victim to a #22 rojo midge. Jason (from the Trophy Stalkers) got into a number of nice fish as well and put on a clinic as to how it's done. 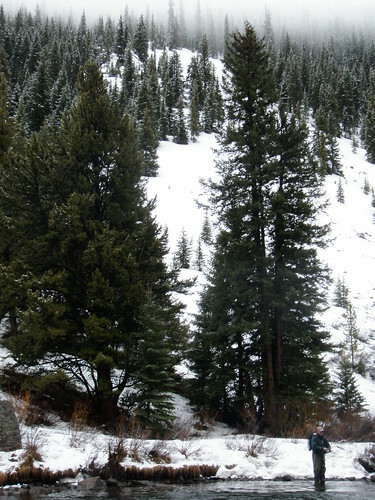 Jason and Matt made the long trek from Minnesota to chase some big Colorado Tailwater trout with us. It was great to fish with them and catch up. Though the flows weren't the greatest, we managed to do pretty well nonetheless. I was able to get into a number of big bows and browns this weekend. 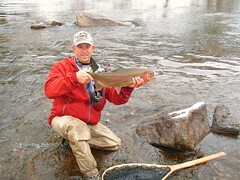 Nymphing was the way to go but also an awesome baetis hatch brought out my dry fly selection and close to 15 browns one day. Despite the common break offs that occur here, my 4x tippet managed to be the way to go for keeping the fight time down and also keep the big boys from ripping downstream becoming just a memory. Travis knows this place well and after the amount of time spent here, I had to tag along and learn a few things about how to fish this popular tailwater. Travis got into some nice pigs and had lot's of action on some smaller ones as well. 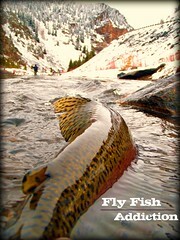 Small flies, big fish that's I'm talking about! Despite a cloudy, snowy weekend we pretty much had the place to ourselves one of the last days we were there. Gorgeous scenery and great company made this a trip to remember for sure. 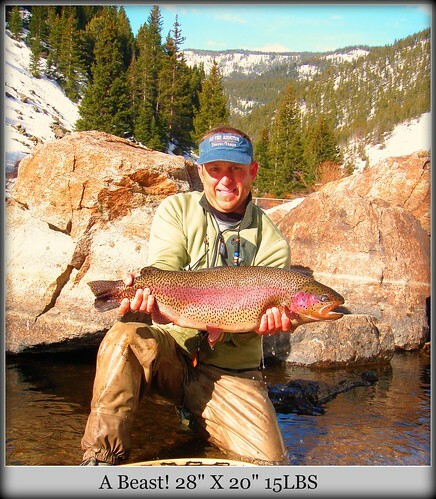 If you're thinking of fishing some of Colorado's top tailwaters remember this: do your homework, bring some good polarized glasses, know your equipment well, don't wing it with a bad knots, small flies only and use some patience...you'll need it!